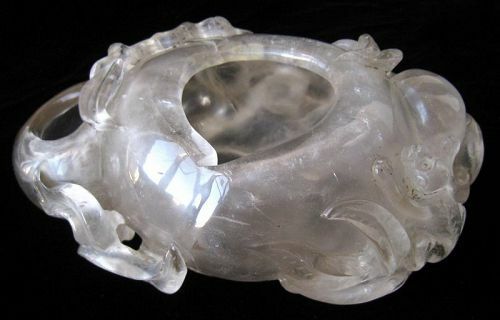 Chinese rock crystal scholar's brush washer. Carved into the form of a large heavenly peach with twisting leaves and branches bearing smaller peaches. A small monkey is carved hanging onto the edge of the large peach, in a playful frog like pose. The reticulated carved brush washer rests on two small carved peaches as the feet. Antique Japanese globular bronze vase. 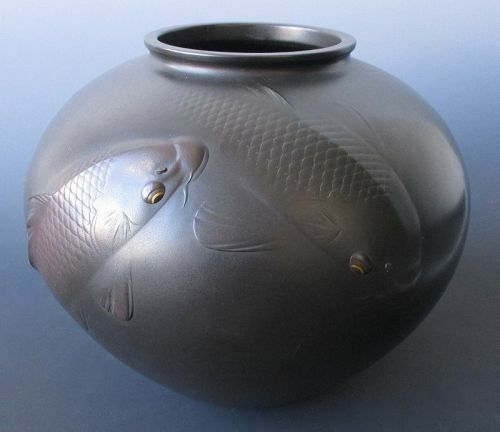 Very simple with 3 raised koi fish swimming together and cresting the surface of the vase as if it were water. The raised details of their eyes are highlighted with gold inlay. Signed Shihou and dated July 18, 1926. 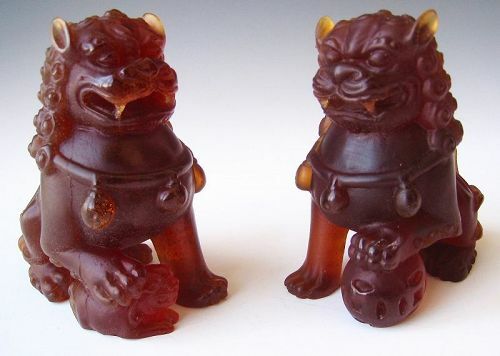 Pair of pate de verre figures of fu dog temple guardians. Made of rich red amber colored pate de verre "glass paste". Originally produced by Daum studio in Nancy, France. Each figure signed "Daum France". Provenance: from a prominent bay area peninsula estate. 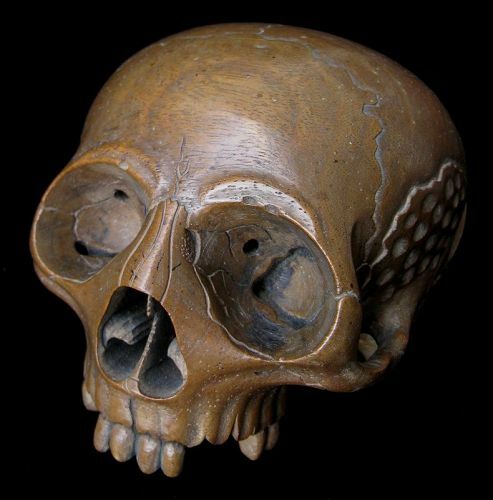 A Japanese Mokugyo wooden temple bell, carved from kusunoki (camphor) wood in the form of a lifelike human skull. 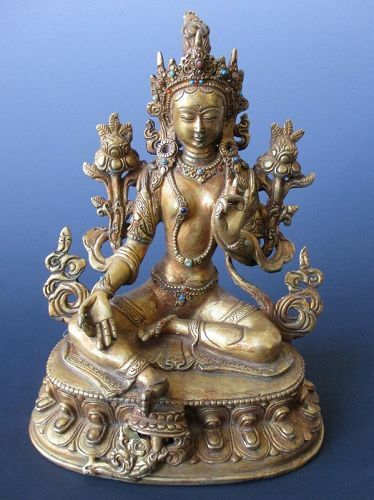 Used to accompany chants (sutras) in Taoist and Buddhist ceremonies. The base of the skull is signed "Bononshi", with matching tomobako. 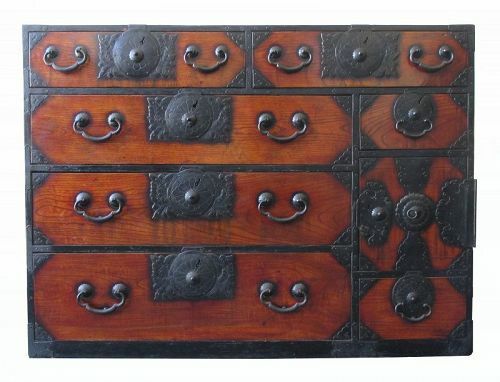 Japanese Antique keyaki (em) wood isho tansu (clothing chest) from the Sendai area. Top portion of the chest has two small drawers (a rare configuration). There are 7 exterior drawers of various sizes and a safe box with a hinged door (with key) covering three small interior drawers. Hardware includes large lock plates with chrysanthemum mon and ornate pierced carved leaves. 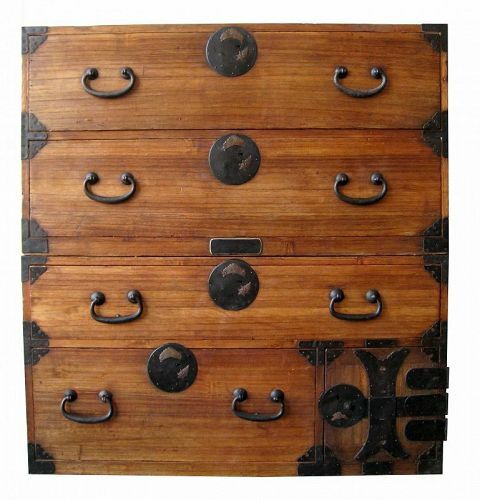 Antique Japanese two section clothing tansu, constructed of Kiri (paulownia) wood with hand-forged iron hardware and plates. The upper unit holds two drawers with two iron pulls each. The lock plate of each drawer overlaid with brass turtle and kiri leaves. The lower unit holds two staggered larger drawers with small safe door. 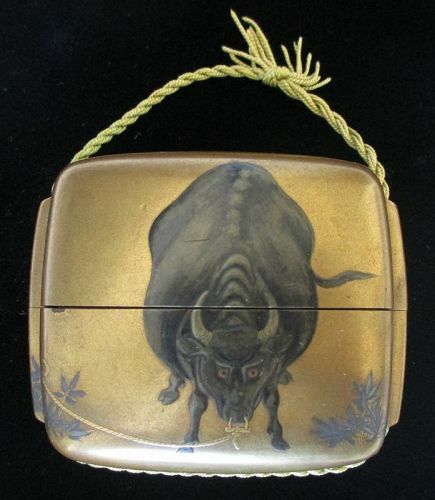 Japanese inro with a large standing bull, frontally positioned with head lowered and looking ahead at the viewer. From the ring in his nose is a rope leading off to the side. The reverse image is a scene, entirely in gold lacquer, of rolling hills and pine saplings in the foreground. The inro opens to reveal a compartment lacquered red on the inside with a small removable inset tray. 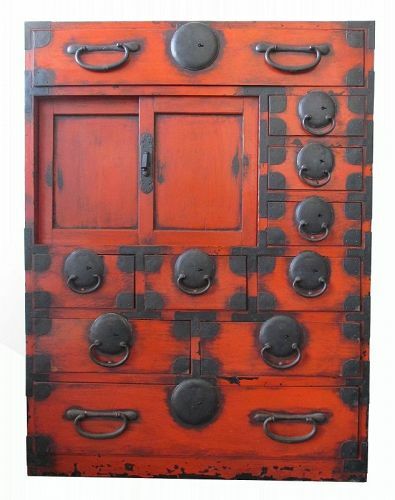 Antique Japanese choba tansu (merchant's chest) with negoro lacquer finish (distressed red and black lacquer). Made of sugi (cryptomeria) wood. This chest has 10 drawers of various sizes and a compartment opened by sliding panels with one interior shelf. Extensive iron hardware includes round lock plates and warabite shaped drawer pulls. From the Matsumoto area of Japan. 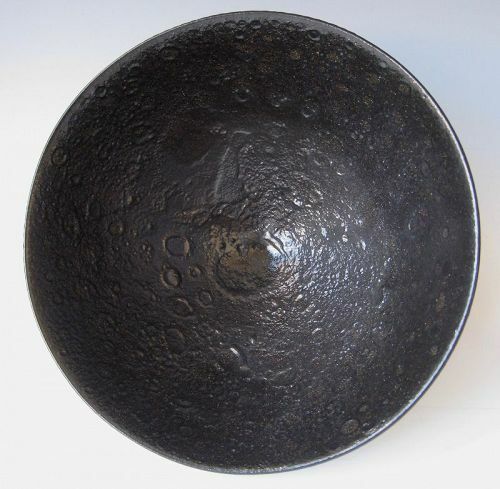 Wonderful medium-sized crater bowl, thinly potted of black clay and with glossy black glaze pitted with craters for volcanic moon-like effect, Signed Lovera; Jamese Lovera (American, 1920-2015) modernist potter. Teacher at San Jose State University. James Lovera exhibited at the Crocker Museum in Sacramento in 2006: "Craters of Fire: Ceramics by James Lovera". With original inventory tag.